If you said “yes” to any of the symptoms above, you may suffer from dry eyes and/or blepharitis. For many patients, using conventional treatments such as artificial tears and warm compresses only temporarily relives these symptoms. To adequately treat these conditions, you have to get to the root of the problem. For many of our patients, the root of the problem lies in their eyelids. Often overlooked in eye care, eyelids play an important role in the health of your eyes. They house important glands that are responsible for the oily layer of our tears. Without the oil provided by these glands, our tears evaporate at a faster rate than normal, causing dry eye symptoms. They are also home to your eyelashes, which can often house the demodex mite. While they can be asymptomatic, these mites are the cause of blepharitis in some people by causing inflammation in your oil glands and eyelash follicles. 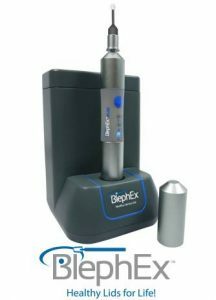 Eyelid hygiene is the first step to treating these debilitating diseases and the BlephEx can play an important role helping you achieve this goal by providing an in-office, deep cleaning of the eyelids. Much like good dental hygiene involves visits to the dentist for periodic deep cleaning, good eyelid hygiene should involve periodic visits to the eye doctor for “deep” cleaning of the eyelids. Dry eye treatments have come a long way and we now understand the eyelids play a major role in chronic dry eye disease. Our office is performing one of the latest advanced treatment for dry eyes, micro-blephroexfolation, with the BlephEx instrument. This instrument exfoliates your eyelids, removing the biofilm that has accumulated on your eyelid over the years. Healthier eyelids will lead to healthier tears and less dry eyes! Call our office to find out more about this new exciting treatment or any of our other services, 760-342-6900, for an evaluation today!